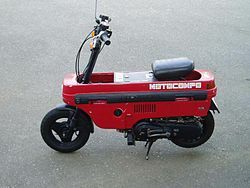 The Honda Motocompo is a folding scooter sold by Honda 1981–1983. The Motocompo was introduced as a "Trunk Bike" to fit inside subcompact cars like the Honda Today and the then new Honda City. The City's baggage compartment was actually developed around the Motocompo. The handlebars, seat, and foot-pegs fold into the scooter's rectangular plastic body to present a clean, box-shaped package of 1185 mm L × 240 mm W x 540 mm H. Honda's initial monthly sales projection for the domestic market was 8,000 City and 10,000 Motocompo. The City surpassed its targets, but in all only 53,369 Motocompos were sold by the end of production in 1983 (no more than 3,000 per month). It was marketed in conjunction with the City in television ads featuring British ska/2-tone band Madness. The Motocompo is probably best known as the bike used by Natsumi Tsujimoto on You're Under Arrest. It is tucked away at the back of her partner Miyuki Kobayakawa's Honda Today police car when not in use. It was released as a Bandai Model kit. ^ "Years made" (in Japanese). honda.co.jp. Archived from the original on 2008-03-03. Retrieved 2008-02-19. ^ "Initial sales projection" (in Japanese). honda.co.jp. Retrieved 2008-02-19. ^ "Total sales". Yasu.Tanaka. Retrieved 2008-02-19. ^ CM Honda City (television) (in Japanese). Honda. 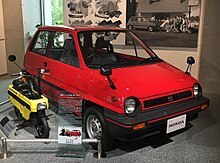 Wikimedia Commons has media related to Honda Motocompo.